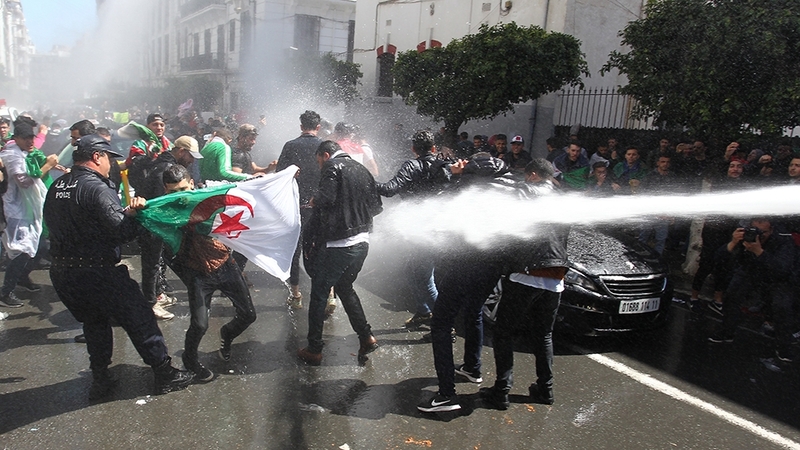 Police in Algeria‘s capital have fired tear gas and water cannon at thousands of students protesting against the appointment of a new interim president who is a part of the ruling order they have been seeking to remove. Footage showed security forces moving in on the demonstrators shouting “out with the system”, dousing them with pepper spray, shooting from a water cannon and using batons to break up the crowd. Bensalah’s appointment is in accordance with Algeria’s constitution but the protesters who drove Bouteflika out after 20 years in office are unsatisfied with the move because he is a key ally of the former president and a seasoned establishment insider. Bensalah, who cannot run in the polls, does not have the support of the opposition parties, which abstained from Tuesday’s session in parliament. In a televised speech to the nation on Tuesday, the 76-year-old promised to organise free elections within his 90-day tenure and said he hoped they would result in a president committed to building a new Algeria. Bensalah also announced plans to urgently create a “sovereign” body, with the help of the political class and civil society, to help lay down the required conditions for “honest and transparent” polls. Bensalah is one of the three figures appointed by Bouteflika to key posts that protesters are demanding leave, dubbing them the “three Bs”. The others are Noureddine Bedoui, appointed last month as the head of government, and the chief of the Constitutional Council, Tayeb Belaiz, who would replace Bensalah in the case he resigned. “Out with Bensalah, Belaiz et Bedoui!” protesters shouted on Tuesday as they massed at the square in front of the main post office, a symbol of the widespread rallies. “Ninety days is merely enough time for the system to maintain itself and give itself a new figure, a new facade,” said Amina Afaf Chaieb, an Algerian activist taking part in weekly pro-Algerian democracy protests in France’s capital, Paris. “What we want is a democracy and huge institutional reforms,” she told Al Jazeera. That failed to appease protesters, who saw the moves as a trick to prolong his time in office. 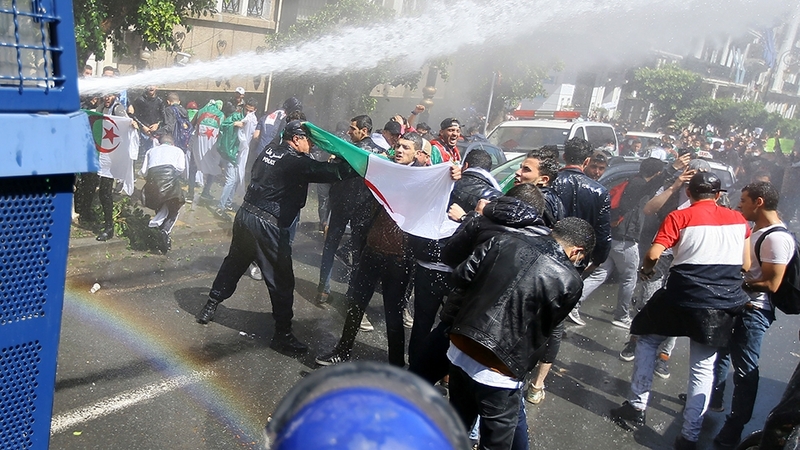 As protests continued, Algeria’s military joined the calls for Bouteflika’s departure, which ultimately led to his resignation on April 2. General Gaid Salah, Algeria’s powerful army chief, carefully managed Bouteflika’s exit after declaring him unfit to stay in power and expressed support for protesters. Algeria’s influential military says the country’s people are entitled to a peaceful atmosphere but hasn’t commented yet on the appointment of Bensalah as interim president. The Defense Ministry said in a statement on Tuesday that the army will work to ensure “the Algerian people’s legitimate right to enjoy total tranquility for the present and the future of the country”.